This lens is ready-made nostalgia; it was as if I couldn’t face the moment without filtering it through the false notion that it was in the past. 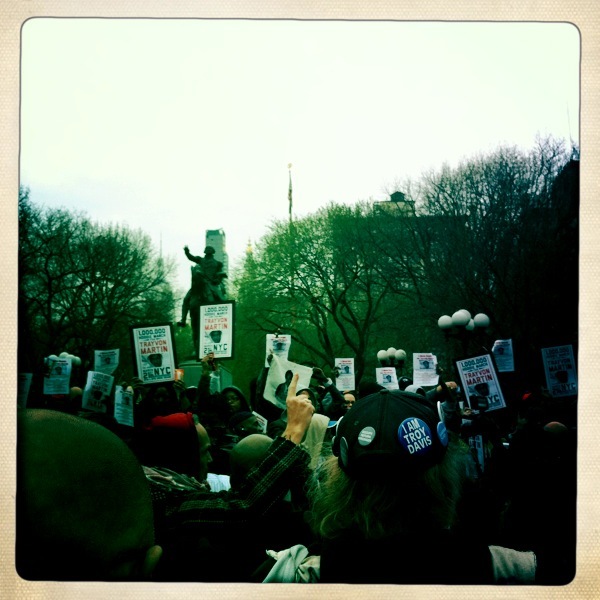 I was shocked to see I chose to document the Million Hoodie March in New York City with the Hipstamatic app on my iPhone. I made the decision partly to get saturated colors on a grey day but I can’t help but see the underlying subconscious impulse: yearning to be part of some historical narrative to avoid engaging with the present. Travyon Martin’s death demands that we collectively re-evaluate what we think of as in the past. It is but one example of hard evidence that legally sanctioned race-based violence is still deeply present. The march, which took place on March 21st, was organized in response to the shooting of seventeen year-old Travyon Martin. People were gathered to show support for Martin’s family and to demand George Zimmerman’s arrest. Martin was a black teenager who went out in a hooded sweatshirt on February 26th, unarmed, to get some late night snacks at a convenient store. When he was returning to the gated community in Florida where he was visiting his father for the weekend, Zimmerman, the neighborhood watch captain, deemed him to be suspicious and shot him dead. I am telling you this for the historical record. If you find this essay twenty years from now, there may be another case du jour of racialized violence. Or the wound may still be present. It was twenty-years ago this past week that the Rodney King beatings spurred the riots in South Central LA. Time moves in strange ways. For the last issue of RECAPS, many of the editors had ongoing conversations about community formation and activist possibilities through the lens of geographic distances. In gathering content for this issue, I was thinking about what would shift if we looked at these phenomena through the lens of temporal distance. This is in no small part because of the fact that two of the historical moments I identify most strongly with have very recently been seeping into the collective consciousness through processes of commemoration. The month of April marked the 25th anniversary of ACT UP (AIDS Coalition To Unleash Power) (Maddow on ACT UP at 25) and the 50th anniversary of the Port Huron Statement, the founding document of SDS (Students for a Democratic Society) (Port Huron at 50 on Democracy Now!). When I first learned about these activist histories in my early college years, I felt an un-theorized sense of melancholic nostalgia. The apathy engulfing the present felt insurmountably distant from the historical examples of resistance, radical community and experimentations in love and collectivity that I had envisioned these moments to be. My emotional reaction of having missed out could only happen from a vantage point at the intersections of privilege , both generational and socio-economic. Now that I am revisiting these activist histories from a place of more experience and critique, I feel a sadness that is caused by their proximity to the present rather than their distance: Many days it feels like nothing has changed. 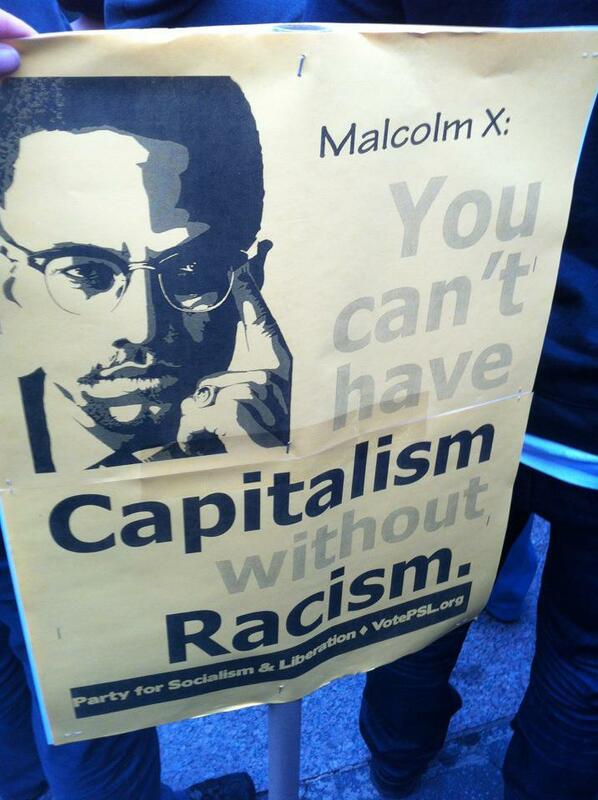 Yet we must continue to fight as if change is not only possible, but eminent. I have always been oriented towards the past. Like many kids of the 1990s, I embraced round two of (commodified, evacuated) flower power aesthetics: beaded curtains, lava lamps, and inflatable chairs. But my particular relationship to the 1960’s and its aesthetics started obsessively in elementary school and continues to this day. As a book-wormish baby queer, I did not particularly fit in. To quote Oscar Wilde, “Popularity is the one insult I never suffered.” I turned to the past as an escape: my imaginary psychedelic tree house. From making my beanie babies dance to Sgt. Peppers to spending recess in a corner with whatever books I could find on the subject, I steeped myself in the mythology of the era. In my young adulthood, I began studying the decade from a more scholarly angle, and finally was able to decode the aesthetics I had associated with light heartedness as responses to violence and struggle. 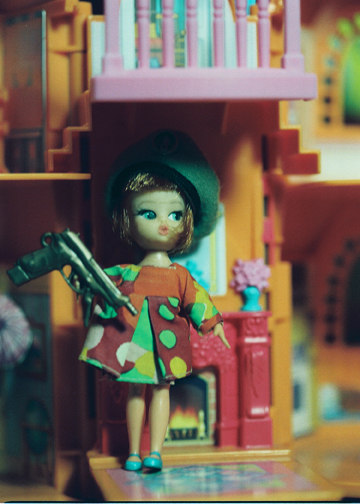 The photo above was made the summer after my freshman year of college, when I learned about SDS, SNCC, the Weather Underground and Black Panthers — my favorite childhood toy reframed as I began to see a more complex picture of her time of origin. I have come very close to my life-long fantasy of visiting the 1960s: a yippie-esque gesture of a jar with Free Money set up on the sidewalk, a mobilized mass of people protesting structural violence, teenagers getting high around the periphery of action. The Million Hoodie March embodied an uneasy combination of optimism and pessimism. The presence of so many people coming together mixed with the unavoidable heaviness of loss felt collectively. 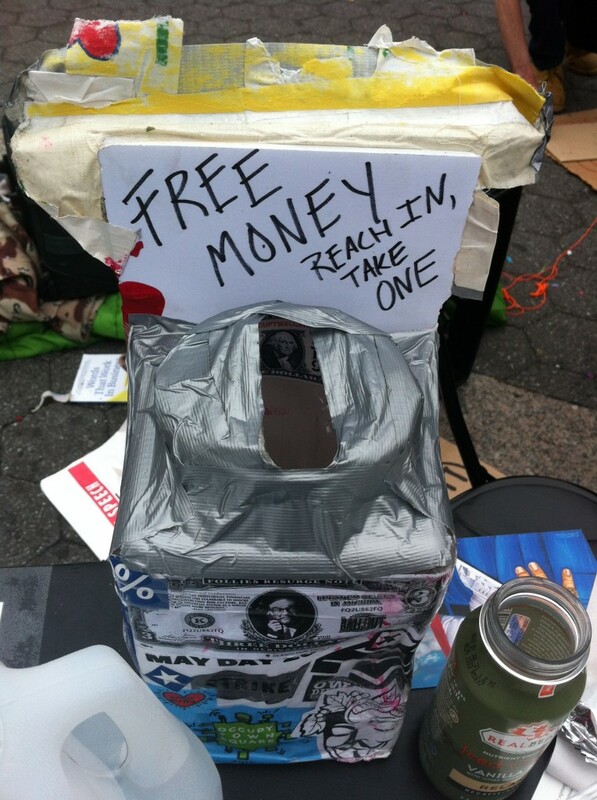 It took place in Union Square, where OWS had set up a renovated campsite minus the tents. There were people giving out buttons and posters, stacks of the Occupy Theory publication Tidal. And yet as my Hipstermatic photos suggest to me, it’s easier to experience these moments through narrativized distance than it is to be present with all the complex emotions, risks and uncertainties of activism. I often scour the Internet for political graphics. Text from moments passed reading “Lesbian Liberation, We’re Never Going to Get It Under Capitalism” ring more true to me than an equal sign sticker. I like to convert these digital graphics into objects that I can hold. I began reshooting some of them around my studio with the same filter I documented the march with. 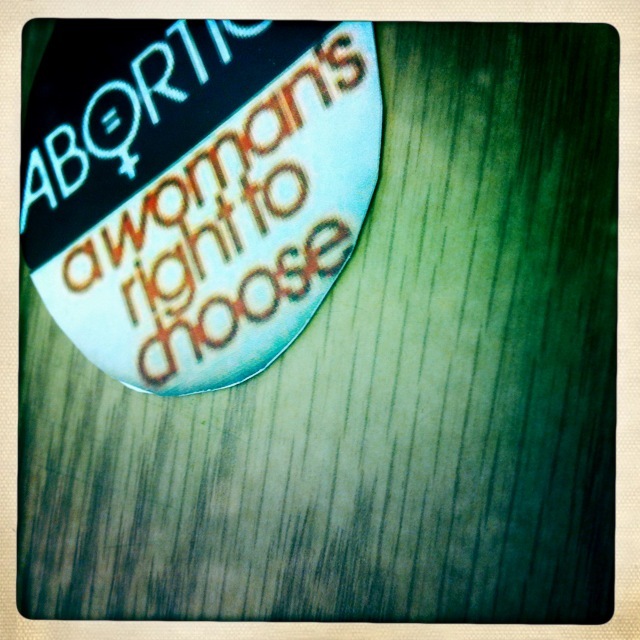 Decades have passed since that pin was originally mobilized, but women’s reproductive rights are still in jeopardy. 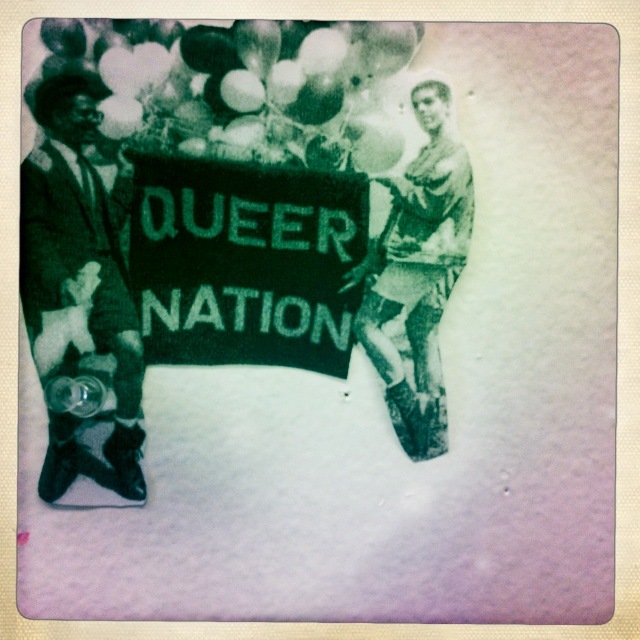 Queer nation now evokes homonationalism and pink-washing instead of anarchic performances and direct action. (Israeli Apartheid Week video with Judith Butler, Jasbir Puar, John Greyson). I think about ways we slip backwards. But luckily new aesthetic strategies of resistance are emerging, fertilized by archival tendencies. I have a roll of Silence = Death stickers on my desk. 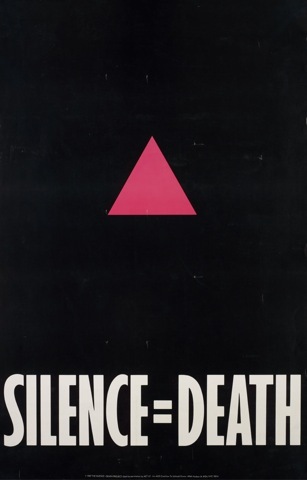 Silence = Death is arguably the defining graphic of ACT UP. I made these reproductions as part of my undergraduate thesis (ACTUP download) and they seem to acquire the weight of new relevance each day. 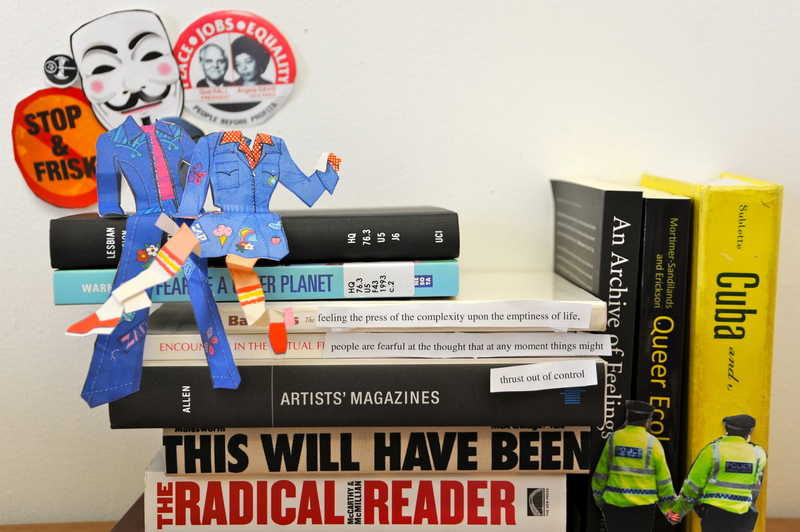 I wanted to study ACT UP to mine tactics for making politically effective art and to better understand the connections between direct action and cultural production. As Avram Finklestien of Gran Fury and the Silence = Death project told me in 2009, “Silence=Death was a viral campaign, way before that idea was common. One of the things that ACT UP did was create a huge sense that we were everywhere by making small stickers that really cost pennies to make.” Avram posted a new graphic on his Facebook a few days ago, ACTUP Robin Hood download.jpeg. 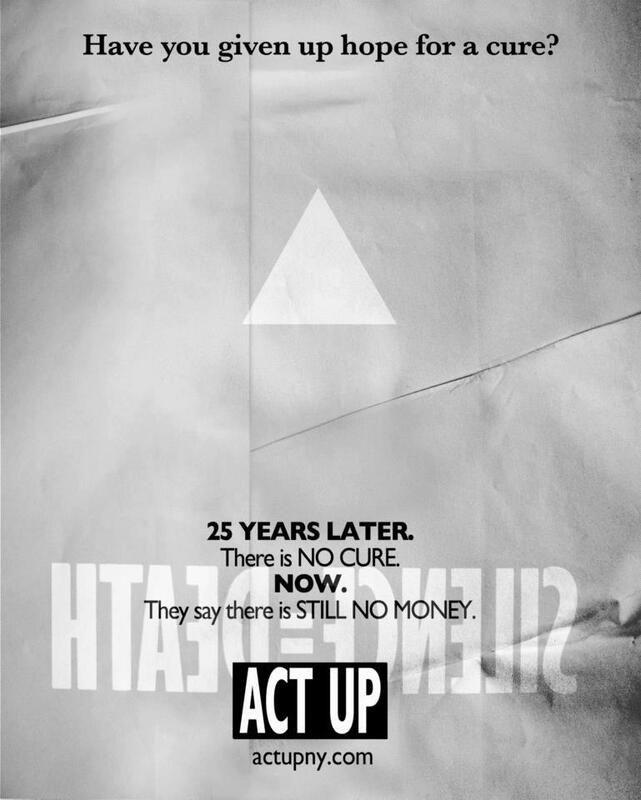 The 25th anniversary of ACT UP is being marked by its rebirth. While ACT UP never stopped functioning as an organization, its NYC chapter lost significant momentum in the early nineties. Due to the tireless work of ACT UP and other organizations, drugs were available and at less exorbitant costs. Many activists died and others lost momentum after years of attending countless meetings into the wee hours of the night. One of the first major actions the ACT UP staged was a protest on Wall Street in March 1987. Members of the group were known for the savvy to identify centers of power. Wall Street was controlling access to experimental drugs with a bottom line defined by dollars and not human lives. Sound familiar? ACT UP New York is planning actions in conjunction with OWS to advocate a Robin Hood Tax, continue the fight for universal health care, and demand attention to the problem of AIDS nationally and internationally. Cultural entropy is a strange brew. From retro activism to retro chic. As I aimlessly procrastinate in the blogosphere, I stumble across a feature on fashion at the music festival Coachella. Fringe, crochet, long dresses, short-shorts, altered American flags, floppy hats. These are images from a festival where a Tupac hologram performed. RECAPS is an experiment in virtual and embodied history as much as it is one virtual and embodied community. We are digging in archives while trying to make new ones. Occupy is coming out of hibernation, daffodils are blooming, and people are tweeting at #liberationsummer. We pulled together some ideas, ephemera, and snapshots of where we are at today. This is our leaky time capsule.